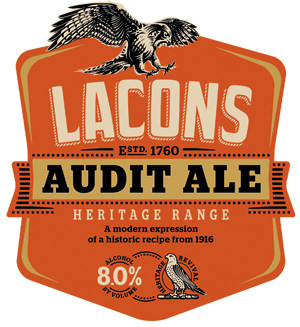 Lacons Audit Ale is a modern expression of a beer originally brewed for the University of Cambridge and University of Oxford’s annual audit feasts. It was exported to United States in the 1930s. A powerful 8 percenter that’s a faithful re-creation of the strong ales brewed for centuries for colleges when the annual accounts were finished and celebrated with a feast. American graduates from Oxford and Cambridge used to stage an annual celebration in New York City with Audit Ale imported from England. The new version, bottle-conditioned, is brewed with pale and crystal malts and hopped with Bramling Cross and Cluster. It has biscuit malt, butterscotch and hop resins on the nose, with tangy fruit, rich toffee and nuts in the mouth and finish. It’s worth laying down a bottle for a few years. This pale amber-colored barley wine opens with a full-on strawberry aroma that is also a little smoky. That hint of smoke continues in the mostly bitter taste but with sweet strawberries and oranges well to the fore. Alcohol is nicely controlled but still gives a little warmth, especially in the dry, increasingly bitter and slightly woody finish, where fruit continues to feature. This is a beer that needs time in the bottle, to raise the carbonation a touch and to allow the flavors to mellow. It’s a fine beer already. Time will make it impressive.